cDNA-RDA is one of the subtractive cloning techniques used to isolate differentially expressed genes between two complex cDNA populations. In the present study we present a modification of the protocol described by Hubank and Schatz. In the post-hybridization mix, the 5'-ends of homoduplexes of interest (tester-tester) are filled-in with α-thio-deoxynucleotides. Unprotected duplexes, as well as the single-stranded DNA fragments, are degraded using ExoIII and Mung Bean Nuclease, prior to PCR subtraction, resulting in less complex difference products. We illustrate this modification by the cloning of a new gene which is differentially expressed in normal, reelin and Dab1 mutant mice and is a candidate member of the Reelin signalling pathway involved in brain development. We propose a modification of cDNA-RDA that may reduce the complexity of the post-hybridization mix and thus facilitate the amplification of differentially expressed products. Representational difference analysis of cDNA (cDNA-RDA) is a PCR-based subtractive hybridization technique for isolation and cloning of differentially expressed transcripts between two complex cDNA populations, without prior knowledge of their functional or biochemical characteristics [1, 2]. 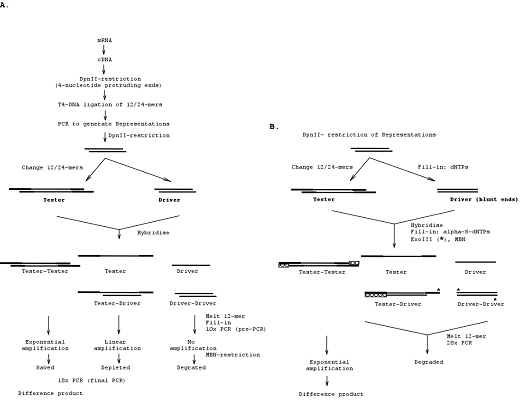 The classical cDNA-RDA method, summarized in Fig. 1A, allows the selective amplification and cloning of transcripts that differ in abundance between two populations. Two complex cDNA populations are restricted with DpnII (restrictase that leaves 4-bp protruding 5' ends) and ligated to suitable linkers, the sequence of which is specific for the procedure. The amplicons, that represent the original RNA populations, are therefore called "representations" and provide the starting material. Next, the "tester" representation – from which isolation of specific messages is sought – is mixed with a large excess of the "driver" representation. After this subtractive hybridization, tester homoduplexes are enriched from the mixture by PCR (pre-PCR). Single strands are degraded using Mung Bean Nuclease (MBN), and a second PCR (final PCR) generates a complex population of amplicons that is named difference product. The procedure is usually repeated at least twice, increasing the ratio of tester:driver from 1:100 for the first round to 1:800 for the second and 1:40 000 for the third rounds. This protocol yield fragments visible as discrete bands on agarose gel that are cloned and sequenced for further analysis. Schematic presentation for the protocol of cDNA-RDA (supplied by D. Schatz) and its modification. A. Classical strategy . Double stranded cDNA is derived from the original mRNAs by RT. After digestion with DpnII, the resulted 4-nucleotide protruding ends are ligated to suitable linkers (12 and 24-mers) and subjected to PCR to generate amplifiable populations named "Representations". Following the hybridization step, the tester homoduplexes are enriched in the mix by 18 cycles of PCR (pre-PCR). The mixture is treated with Mung Bean nuclease to enrich the mix in tester sequences and is subjected to a second round of PCR (final PCR) to generate a final Difference Product. B. Modified protocol. After DpnII-restriction, the representations are filled-in with dNTPs. Following the subtractive hybridization, the 5' recessed ends of the target tester homoduplexes and the driver strand of the heteroduplexes are filled-in with α-thio-dNTPs, to render them resistant to Exonuclease III cleavage. The other components in the mix are degraded by Exonuclease III and by Mung Bean nuclease. The mixture is subjected to 28 cycles of PCR to generate a Difference Product. In the modification of cDNA-RDA, schematised in Fig. 1B, the classical protocol is followed to generate tester and driver representations from normal and mutant brain poly(A)+-RNA. Following DpnII cleavage and prior to subtractive hybridization, the 5' protruding ends of the driver are filled-in by normal dNTPs using Klenow. After hybridization, the recessed ends of duplexes, containing tester fragments, are protected from degradation by Exo III by filling with α-thio-dNTPs, and Exo III is used to digest the heteroduplexes and driver homoduplexes that are unprotected by α-thio-dNTPs . Single stranded fragments and single stranded extensions from the ends of duplexes are degraded by MBN. Next, the mixture is subjected to the 28 cycles of amplification in the same PCR conditions as in the classical RDA protocol, to generate a difference product. In our experience, this simple modification, a variant of which was proposed before , is able to generate a difference product that appears as discrete bands on agarose gel after the first round of hybridization (Fig. 2). Agarose gel electrophoresis (1.5% NuSieve, FMC) of representations and a first round RDA product DP-1 obtained using the modified protocol. A. Both representations of normal (lane 1) and scrambler (lane 2) brain transcripts (used respectively as driver and tester) show a smear between 200 and 1100 bp. B. After the first round of subtractive hybridization/amplification, product DP-1 obtained using the proposed modified protocol exhibits reduced complexity with visible bands (lane 2). The negative control of the reaction is loaded on lane 1. C. By comparison, the usual RDA protocol yields a smear in the DP1. D. and discrete bands only in the DP2 product (lane2). On lane 1 is the control reaction. The size o the photos was determined using 100 bp DNA marker (Invitrogen). We were interested in applying RDA to examine how the extracellular protein Reelin influences the expression of specific genes during brain development. For the subtractive hybridization, a representation from normal newborn mice brains was used as the driver. The tester derived from scrambler (mDab1-deficient) brains at the same developmental stage. Whereas the representations showed a typical smear in gel electrophoresis (Fig. 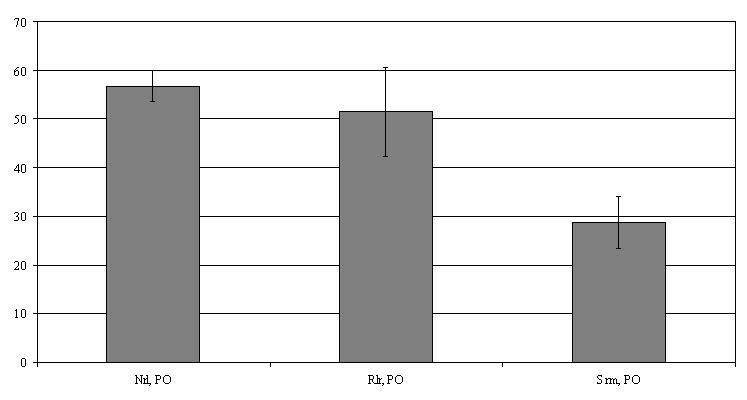 2A), the product of the first round of the modified RDA protocol had reduced complexity, with only a few prominent bands (Fig. 2B). In contrast, in a parallel subtraction carried out with the same tester and driver DNA preparations by following the classical protocol of Hubank and Schatz, a difference product showing a few discrete bands was obtained only after the second round of enrichment (DP-2), as shown in Fig. 2D. The whole products DP-1 (Fig. 2C) and DP-2 (Fig. 2D) were cloned into pCR2.1 (Invitrogen). Six and 8 different cDNA fragments were obtained respectively, from DP-1 and DP-2. None of the 8 DP-2 fragments was differentially expressed. Among the six DP-1 fragments, two were from known mouse genes that code for proteins involved in general cellular functions (alpha-tubulin (Tuba1)) and DNA-metabolism (M-phase phospho-protein); one was highly similar to a novel human gene and three had partial homology to mouse EST. Among the novel fragments cloned, a partial 530 bp long cDNA could be extended to 1146 bp by using alignment with genomic and EST databases, and verification by RT-PCR. Northern blot analysis revealed that this gene is expressed in the brain as an approximately 6.5 kb mRNA (Fig. 3). Duplicate quantitative Northern blots analysis of normal (N), reelin-deficient and mDab1-deficient (scrambler) mRNA was carried out by hybridising blots sequentially with the radiolabeled candidate fragment and with a control beta-actin probe. The signals were estimated using a Cyclone-Phosphor Imager apparatus and the OptiQuant program. As shown in Fig. 4, the expression level of this new gene is comparable in normal and reelin-deficient brains but is reduced by about 50% in Dab1 deficient brains. This observation of reduced expression in the Dab1-mutant mouse brain suggests that this novel gene is a potential partner in the Reelin-signalling pathway implicated in brain development. Because the database searches revealed that this fragment did not match any known entry, it was provisionally named Nam16. The full-length message and its characterization are currently under investigation. Northern blot-analysis using NAM16 as probe. 2.5 microgram of poly(A)+-RNAs from normal newborn (P0) brains were electrophoresed, blotted to Hybond N nylon membranes (Amersham), and hybridized with α32P-labeled DNA probes. Schematic representation of the results from quantitative Northern blot analysis All hybridization signals have been normalised with the signal from beta-actin and estimated using the Cyclone PhosphorImager. Details are described in the text. The bar represents the variation of two duplicate experiments. As other PCR-based screening techniques, RDA can result in amplification bias and generate spurious clones that do not correspond to differentially expressed genes. In our experiment, following the classical protocol, a high number of gene fragments were not differentially expressed. Furthermore, the basic RDA protocol is rather time consuming and labour intensive. In addition to enriching the population in differential tester fragments, the final PCR of each RDA round also yields unwanted products. Among others, this is due to: i) lack of sufficient driver competition in the formation of the tester homoduplexes during hybridization, especially from abundant tester samples; ii) the linear increase in contaminating heteroduplexes; iii) inefficient annealing in the complex mixture after the subtraction step; and iv) trapping of a fraction of the tester molecules in heteroduplexes. All these factors may contribute to increasing the non-specific amplification of spurious fragments that do not represent genes with differential expression between the tester and the driver. In consequence, multiple iterations of the enrichment procedure are usually required in order to increase the proportion of target homoduplex sequences. As a partial solution to these inconveniences, we propose a modification that seems able to reduce the complexity of the amplification mixture, thus rendering cDNA-RDA procedures more rapid and user friendly. By following this modified protocol, we were able to clone a fragment of a novel gene that is differentially expressed in normal and Dab1-deficient mRNA and is thus a potential new member of the reelin signalling pathway. Applying α-thio-deoxynucleotides in the tester preparation for the cDNA-RDA protocol allows to protect tester heteroduplexes in the post-hybridization mixture from the enzymatic degradation of ExoIII. This modification of the original RDA protocol  may reduce the background due to amplified products deriving from false positive fragments, thus reducing significantly the complexity of the post-hybridization mix. In addition, multiple rounds of subtraction and amplification are avoided and the protocol is rendered less time-consuming. This is illustrated by the cloning of Nam16, a novel gene differentially expressed in the brain of normal and Dab1-deficient mice. Normal BALB/c, reelin -/- and Scrambler (Dab1-/-) mice were bred as described . All animal procedures were approved by the institutional Animal Ethics Committee. Brains from four to six newborn (P0) animals were dissected under cold anesthesia and total RNA extracted using an RNeasy RNA kit (Qiagen). Poly(A)+-RNA was prepared with PolyATract mRNA Isolation Systems (Promega). cDNA was synthesised by oligo(dT) priming using Superscript II as recommended by the manufacturer (Invitrogen). Double-stranded cDNA was synthesised from 5 micrograms poly(A)+-RNA and RDA was performed as described by Hubank and Schatz . Restriction reactions were performed with DpnII (New England Biolabs). PCR amplification was carried out using Taq DNA polymerase (Invitrogen). For fill-in reactions, Klenow Fragment (Promega) was added at the proportion of 1 Unit per μg DNA, together with dNTPs (Roche), at a final concentration of 40 μM, and the mixture was incubated for 30 minutes at 37°C for 30 minutes, followed by heating for 10 min at 70°C. Conditions for fill-in with α-thio-dNTP (Promega) were similar. After fill-in, the mixture was submitted to two rounds of extraction with phenol:chlorophorm (1:1) and precipitated with ethanol in the presence of 5 micrograms of glycogen. Digestion was performed for 35 min at 37°C with 300 U of Exonuclease III (Promega) and 10 U of Mung bean nuclease (New England Biolabs) in the presence of 20 mM Tris-acetate, 10 mM Mg++-acetate, 50 mM K+-acetate, 1 mM DTT, 0,05 mg/ml BSA. To inactivate the enzymes 4 reaction volumes of 50 mM Tris. HCl (pH8,9) were added and the samples were incubated for 10 min at 75°C. This was followed by 28 cycles of PCR following the conditions described in . The final difference products were cloned into the pCR2.1 vector (Invitrogen), and sequenced with an ABI prism sequencer using AmpliTAq DNA Polymerase and a Big Dye Terminator Cycle sequencing kit (PE Biosystems, England). 2,5 μg of poly (A) RNA were electrophoresed in an agarose-formaldehyde gel and blotted to Hybond N nylon membranes (Amersham). After UV-crosslinking, membranes were hybridised with [32P]-dCTP (ICN Biomedicals NV/SA) labelled DNA probes prepared with the RadPrime DNA Labeling System (Invitrogen). After overnight hybridization at 42°C in 50% formamide , the membranes were washed twice in 2 × SSC/0,1% SDS for 15 min at room temperature and then once in 1 × SSC/ 0,1% SDS for 15 min at 42°C. mRNA sizes were estimated by comparison with an RNA ladder (Invitrogen). For quantitative analysis, the signals on the membranes were quantified using a Cyclone (Packard) apparatus and the OptiQuant program (Fig. 4). We wish to thank D. Schatz and J. C. Renauld for communication of RDA protocols and advice, and C. Dernoncourt for technical assistance. This work was supported by the Fondation médicale Reine Elisabeth, the Actions de Recherches Concertées (grant 98-02/186) and grant FRFC 2.4504.01.